The key to scheduling your plantings is to identify when your winter days reach less than 10 hours in length. Here at Johnny's Research Farm in Albion, Maine, the Persephone Period begins on November 6th, and ends on February 6th, when daylight at our latitude again reaches 10 hours in length. When temperatures and day length drop, your harvest season need not come to a full stop. 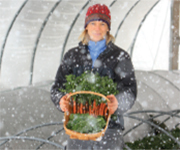 As more growers add high and low tunnels to their operations and participate in winter markets, we are frequently asked, "What can I plant to harvest in winter, and when should I plant it?" Producing marketable crops in winter requires learning the correct planting window times for your location. We've written this guide to provide a starting point, primarily for growing within unheated tunnels. You can use the charts and guidelines presented here while adjusting the techniques and timing to fit your own region and practice. Remember to keep records, to determine what works best and improve upon your successes. 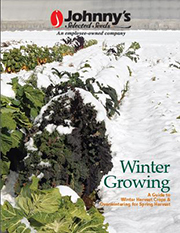 To begin, it is helpful to distinguish between the two main winter growing strategies. The first group you harvest in winter, the second group you leave in place over the winter to produce an early spring crop. Winter-Harvest Crops are planted in late summer or early fall, primarily in high tunnels, for harvest throughout the winter. 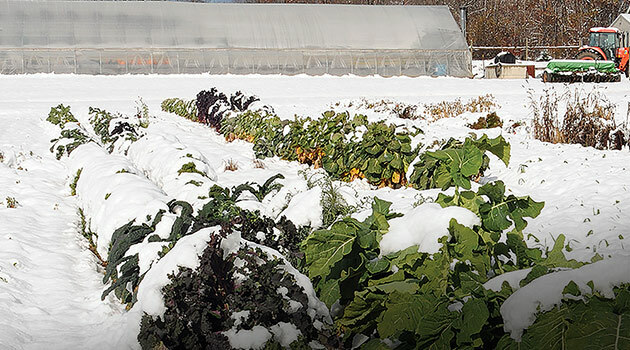 Overwintered Crops are planted in the fall or winter, often outside in the field or under low tunnels, and left in place for the earliest possible spring harvest. There is plenty of flexibility and overlap in the methods employed, including a combination of both strategies together. Use our clickable Winter Harvest Planting Chart as a guide, staggering your plantings for a seamless winter harvest. The goal is to seed your plants so they are at least 75% mature by the time the Persephone period begins. Though plants may not grow appreciably thereafter, they can be harvested as needed while their maturity holds. Careful scheduling allows you to control growth incrementally by planting at least two or three sowings at 7- to 10-day intervals. This will allow for crops to mature at different times and provide a longer harvest period. With well-timed, staggered plantings you can create a smooth transition from one harvest to the next for a steady supply through the winter. Multiple seedings also help you identify the best seeding dates for specific crops, and spread out the risk of crop failure due to unfavorable weather conditions. Transplant crops like spinach that are normally direct-seeded. Start the plants elsewhere and grow them to transplant size before planting them in your high tunnel, after your summer-producing/summer-fruiting crops have been removed. Establish hardy crops outside in late summer, then place a moveable tunnel over them, or construct a caterpillar tunnel over the crop as winter draws near. Anticipate and plan for any open bed space that may become available in late winter, once you have harvested your winter crops. Some crops, like lettuce, will be finished in early to mid winter. Other crops, like mustards, will bolt coming out of the Persephone period. As the end of the Persephone period draws near, they can, for example, be replaced with direct-seeded spinach. These late-winter sowings will be ready for harvest by early spring, often long before the same crop when grown outside.